Three-point shooting specialist was willing to wait a year to play for Bryce Drew’s Commodores. 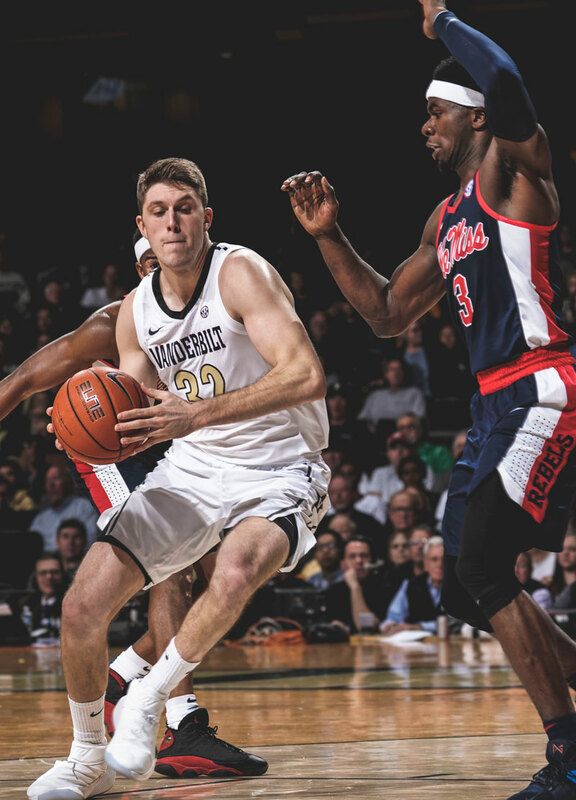 Ryan, now a redshirt junior forward with the Commodores, had played in all 72 games with the Fighting Irish. After his sophomore season ended with an 83-71 loss to West Virginia in the second round of the NCAA Tournament, he decided it was time to make a fresh start elsewhere. Ryan was ineligible to play last season due to NCAA transfer rules. So, he figured, he’d better find a place where he wouldn’t mind taking a year off. “I knew the biggest thing I would have to think about when I transferred was to sit out a whole year, but I knew that I would pick a spot where I would enjoy sitting out for the year, so Nashville was a great draw,” adds Ryan, who has started all 15 games this season. Drew says he knew that Ryan’s shooting skills would fit nicely into Vanderbilt’s offense. Ryan, who was named the high school Mr. Basketball for the state of New York after his senior season, acknowledges the green light to shoot 3-pointers was a big draw to Vanderbilt. Going into Wednesday’s home game against South Carolina, Ryan had made 35 of his 96 3-point attempts, helping Vanderbilt remain one of three schools (Princeton and UNLV are the others) that have made a 3-pointer in every game since the shot was added in 1986. Ryan has a personal 3-point shooting streak, as well, hitting at least one in each of Vanderbilt’s first 15 games this season. He has made four 3-pointers in a game three times, although his season-high for points (19) came in a 90-59 New Year’s Eve victory over UNC-Asheville when he made three 3-pointers. “If it is an open shot, I am going to take it regardless of whether I am hot or not,” Ryan said after the UNC-Asheville game. The unique configuration of Vanderbilt’s Memorial Gymnasium also doesn’t bother Ryan. “A lot of people think that (Memorial Gym is difficult for shooting the ball, but when you are on the court playing, it does not have any affect,” Ryan adds. “I had seen it (Memorial) on TV and thought it was weird to have so much space between the sideline and the student section, but you get used to it,’’ he says. Ryan says he expected to get a lot of passes for open shots from Darius Garland, the point guard considered by many to be one of the most talented freshmen in the program’s history. But Garland played just five games before suffering a season-ending knee injury. Ryan, a former high school quarterback, says his role in the offense didn’t change much, but the lineup without Garland remains an adjustment for the Commodores. “We were playing small ball with Darius at (point guard),” Ryan says. “Now we are playing a little bit bigger. But for me, personally, I don’t think my game has changed that much. I still just try to find spots. Simisola Shittu, who has taken some of the assist responsibilities since Garland was injured, says he relies on Ryan to keep the offense moving. “Having shooters on my side like Matt Ryan and Joe Toye makes it easier for me to do my game,” adds the 6-foot-10 Shittu, who was named the Southeastern Conference’s Freshman of the Week last week. Ryan says Vanderbilt’s defense also has adjusted well without Garland. Ryan didn’t travel to any road games during his redshirt season, sitting on the bench only for home games. With two seasons of experience in the Atlantic Coast Conference – Notre Dame is an ACC member for all sports except football – including games at Duke, Florida State, Syracuse and Louisville, he is ready to play in some of the famous arenas in the SEC and offered a comparison of the two leagues. SEC defenses have not been kind to Ryan in Vanderbilt’s first three conference games. All of his points (15) have come on 3-pointers, but he scored just three points on 1-of-6 shooting in road losses to Georgia and Kentucky. Ryan, who is majoring in economics, already has a game plan for life after Vanderbilt. He says he is registered to take the test used by most graduate schools as an entrance exam this month, and he would like to work on a master’s degree in finance. But he says he has no plans to limit Ryan’s shooting against the SEC.